This article was written by the Aotearoa Workers Solidarity Movement (AWSM) – an anarcho-communist group in New Zealand/Aotearoa – and sent to us for publication. Though the precise details and personalities may vary between nation states, the slime and contradictions of representative democracy know no borders. Arguments over the different approaches to last week’s European elections continue in the UK, between those advocating tactical voting, spoiling your ballot paper, or avoiding the polling station altogether. And the fallout has already began with a UKIP councillor already banned for racism and homophobia. Whether in UK or the opposite side of the globe, the election circus tries to dazzle and distract us away from organising for real change. Here, as there, it is in our communities, our workplaces and our everyday lives that real politics can happen, away from the hype and spectacular and infographics of the occasional marking a box in a ballot paper. See also our critique of the European election charade. 2014 is an election year in New Zealand/Aotearoa. So far, other than a lacklustre budget and equally lame response from the government’s rivals for power, there has been little of substance on offer. Nevertheless, there has already been some re-alignments and changes in personnel within some of the political parties. Let’s have a quick look at the current mainstream political landscape and see who is in the running. The ruling National Party has made no changes at the top. With smiley Mr Key still doing well in the polls as preferred Prime Minister, its business as usual. The only change has come in his recognition that his coalition partner’s in the ultra free-market Association of Consumers and Taxpayers (ACT) is dead in the water. The latter have recently brought back the scourge of the 1980’s, Richard Prebble to try and help them out of their predicament. It’s unclear however, why going backwards will help them to go forwards. Key knows the time has come to search for an alternative minor coalition partner. Hence his talking up of the relatively new Conservative Party and its owner, the fellow multi-millionaire Colin Craig. Some might question supporting a guy who isn’t sure whether humans landed on the moon (newsflash: we did) but this is fairly shrewd politics, for reasons explained below. 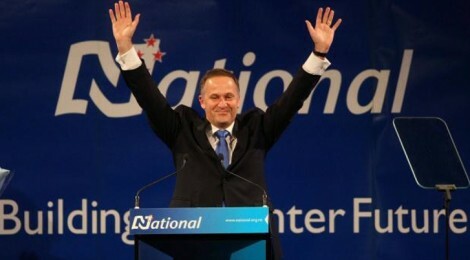 Key is also not exactly enthusiastic, but is keeping his options open regarding the populists of NZ First. It’s leader Winston Peters is a long-term opportunist zombie who owes his current resurrection to Key’s hostile commentary during the last election and the sympathy the attack engendered amongst Peter’s peripheral voters. Then there’s the Maori Party who are undergoing leadership changes and a drop in support due to being too cosy with National. The combination of forces Key is able to put together is of course dependent on the results of the election, but its essential composition is clear. The Labour Party has failed to gather support beyond its current base, despite a change in leadership. Another new change has been the bringing in of left-talking union boss Matt McCarten to supply a clearer focus to their activities. McCarten’s decision seems based on a few chats that gave him the impression Labour Leader Cunliffe isn’t quite as flighty as he thought. Not exactly a resounding endorsement but perhaps he feels there’s nowhere else to go. Shane Jones, a loser in the leadership contest, has been lured away from parliament by the bait of a job overseas. Some argue this is a blow to Labour’s hopes of holding onto the blue-collar male moderate supporters it needs and the chance to avoid the perception it has been captured by middle class liberals and identity politics. Cunliffe’s attempt at damage control by insisting the party is bigger than one person is true, but coming this close to an election, such a defection certainly doesn’t help them. The Greens have stabilised their leadership and poll ratings, having been shifting rightwards in recent years and we are unlikely to see any changes there. There’s also Mana a left-split from the Maori Party, which might take support away from the Maori Party but whether it chooses to take money from the internet millionaire ego-monkey Kim.Com or not, really has limited options. They can either join the Greens and Labour in a coalition requiring uncomfortable compromises or take an independent stance and be side-lined. To sum up, all very ho hum. There’s just enough movement to give the impression things are happening. Most people accept that adjustments within current parameters constitute ‘politics’. However, before we get diverted by the day-to-day smoke and mirrors of an election year, let’s step back and look at the big picture of how things are set up. Let’s survey the overall system the parties, their personnel, spin-doctors, media, party supporters and hangers on operate within, to get an idea of what’s what. Starting at the top you have Betty Windsor a.k.a. Her Britannic Majesty Queen Elizabeth of the United Kingdom, the Falkland Islands and a few other places etc. This person owes her position not to merit or achievement but simply to birth. Oh, and she lives on the other side of the world, so has to get somebody else to represent her in this country. The Governor-General, who is unelected, makes the occasional speech, opens a bridge or has tea parties for V.I.Ps and undertakes other such arduous tasks for a few years. He or she has some mana/prestige within the establishment and is given the role as a way of pensioning him/her off before they formally retire. Below the monarchic elements of the system, we have the Prime Minister who runs the government via the cabinet. These are a small grouping of MPs hand-picked by the Prime Minister rather than voted into those roles by anyone. This being the case, they tend to think along very similar lines to the boss or at least never step too far out of line if they want to retain their positions. The remaining members in the governing party and its support parties have almost no influence over what happens beyond the small number of policies they request in return for supporting the major party at the outset of the government’s formation. This is either because they support their leader or realise that to defy him/her would mean being dropped off the Christmas card list, denied photo opportunities at election time and a range of other sanctions including outright losing his/her job. As for the so-called opposition MPs, they make the occasional fiery speech for TV consumption while working amicably with the government members on various committees. In truth, harmony of interests tends to be the daily reality for nearly everyone involved in the process. In the current system, there are also list MPs who are chosen by the party and can gain a seat without having any meaningful support among the population. These politicians are even more beholden to the party bosses than those actually voted in directly. In the case of the latter, they are permitted to hold their positions by a strange kind of magic. The votes given on one particular day allows the person elected to stay in his/her seat for three years and somehow ‘represent’ the wishes of thousands of people on a myriad number of complex issues. If you don’t actually agree with what they say or do, well too bad for you, come back in three years and have another one day decision about his/her track record. Another curious feature of the current system is one that sounds potentially positive but tends not to be. That is the way a minor, often very minor component of a ruling coalition can get its way in return for joining the ruling coalition. For example, the extreme free-marketers of ACT. This party has been gradually losing what little support it once had through a combination of scandals and changes in leadership. It currently sits at around 1% support in most opinion polls. Despite its obvious lack of support, ACT has been able to introduce legislation such as the 3 strikes law in the justice area, highly contentious charter schools which use government money yet are privately run and allow very little oversight and a savagely anti-worker 90 Day Act which permits workers to be fired within that period with no reason given. With 99% of the voting age population supporting somebody else, this isn’t a case of ‘the tail wagging the dog’ so much as the flea on the tail of the dog wagging the poor canine! A further example has been United Future, the one man band Peter Dunne vehicle, which at one point recently couldn’t even prove it had 500 members. Despite this, Dunne has spasmodically been a government minister overseeing the introduction of various bits of legislation that effect 4.4 million people. He has also been in the position to kill legislation as the deciding vote in parliament, most recently on a bill that would have cut down on the plague of loansharking. As mentioned in the introduction, it may seem odd that a major party like National would actively seek the support of a minnow like ACT or now the Conservatives. However, it’s a shrewd safety valve that allows the introduction of the sort of extreme legislation factions of the National Party would like to see but have difficulty selling to the electorate in their own right. They leave it to the minor party to do the dirty work they sympathise with, while claiming an outward image of ‘moderation’ and ‘reasonableness’. Apart from the government and the parties that it comprises at any point in time, there is also the bureaucracy which is charged with the task of implementing whatever schemes the politicians come up with. The bureaucracy has changed its composition and focus in recent decades. In the past there was at least lip service to the idea that it existed as a ‘civil service’ to help society or the populace at large. Now however, the dominant ideology is one that has borrowed the outlook of private business. People are no longer being thought of as citizens with natural rights, more ‘clients’ who are provided with ‘services’ from agencies that have ‘mission statements’. Regardless of the exact jargon used, its size or composition, an important fact has remained the same, none of the thousands of people working for the government bureaucracy were elected to their positions. That is not to say you never get any help from them when you need it. Good work still gets carried out by some of them even when under pressure and overworked. On the other hand, anybody who has been at the mercy of an unelected WINZ [government welfare agency] case manager who has bungled a benefit payment needed to survive on, might wonder if there’s really any meaningful democracy to be had. When you look at the aspects of the system outlined above, it is perhaps tempting to offer solutions or reforms that could help improve some of the more absurd or nasty bits. For example, emulating the majority of the world by eliminating the symbolic role of the monarchy and probably changing the flag in the bargain, the latter being something Key has floated in the lead up to announcing the election. Regular binding referenda on important issues, changing the threshold for parties to gain seats in order to temper the influence of minor parties, maybe changing the way the list works or the number of MPs, having a different form of proportional representation such as STV, changes to how the bureaucracy operates and so on. Some of these might actually improve bits and pieces of how things are done but even if all of the best stuff was implemented to the best degree, more important problems would remain. Chasing minor reforms or even fairly radical ones is a well-meaning endeavour. The positive aspects of the system that exist have historically come about through a combination of strong outside pressure upon the powers that be and some recognition from the ruling class that they need to make concessions to help the system run effectively. It is worth remembering in this regard that whenever you are told not to do something because “it’s illegal”, that every law that currently exists never used to and therefore the behaviour or action it permits was also once illegal. However, confining your efforts to the formal political arena ignores those aspects of our lives that matter more but have even less democracy or justice to them. It also allows the current exploitative economic system to remain intact, though obviously various laws can affect the parameters of it. Taking the point about other parts of your life, as a thought experiment assume you are working somewhere and that the workplace you are in is an independent country. How would you describe the governing of that ‘country’? Chances are, you are living in something that looks more like a dictatorship, whether severe or relatively benevolent, rather than a democracy. You probably have no say over when you can start and finish work, the number of hours of employment, when you can have a tea break or lunch break or how long they are, who you work with, what you can say to customers, how many people you work with or who they are and what they do. In some cases you can’t choose what you can wear, you probably never voted any of your bosses into their positions, you have no say over what is produced or not and how many or how often, who customers are and a host of other basic things. In a very limited sense it is true you have the ‘choice’ to work somewhere else and ‘emigrate’ or flee the regime in the fiefdom you are working in. However, there are real obstacles to that such as mortgages, the needs of your children or the financial difficulties of getting by bill-to-bill, making it hard to just ‘up stakes’. Even if you have the option to look for another job and don’t end up unemployed, your new one it’s likely to be as bad as or worse than your current predicament. Even though there are a lot of workplaces that operate like mini dictatorships, others are relatively positive environments. In those cases they do give you limited say in the timing of things such as when you can have lunch or for how long. Maybe you even get a chance to own shares in the company, though the company will own 100% of you and you will own 0.0001% of it! Though work is where we spend the majority of our waking lives, the same lack of real control holds true for aspects of our lives outside of employment. Most schools for example correspond almost exactly in the way they operate to the places we work in, as do a whole bunch of other organisations and institutions in wider society. That’s no co-incidence. We shouldn’t instantly dismiss chances to improve things when we can, but surely there’s a heck of a lot more that could be done and in a better way too? Do we want to spend an entire lifetime just turning up to work every day and the ballot box every few years, trying to adjust things a few millimetres to the left or right and leave it at that? Anarchists believe we can all do a lot better than tinkering with a political system that enforces an economic order hell bent on making profits for a minority and generates poverty and environmental destruction while lacking any meaningful democracy. Real change won’t come from the removal of a political leader here or a policy change there. Instead we reckon it’s both desirable and possible to develop a new approach, one where we take control of our own lives rather than putting our faith in a small number of bosses or politicians to solve stuff for us. We can work together to find ways of doing things that we really want in ways we really want. Getting from current conditions to something closer to what we need, is not going to be easy. Let’s face it, just getting by day-to-day now is hard enough. It isn’t as if our goal will come out of thin air though. Consider for example the fact that nearly 90% of workplaces in this country have 20 workers or less. This existing reality provides a basis to re-organise things so that we both own and control these workplaces and operate them democratically for the good of everyone in society. Twenty people each with various skills to contribute could meet regularly and decide what goods and services are needed. Experts and brain workers would be just as valued as at present. The difference being they wouldn’t be given control over other workers or allowed to accumulate relatively huge amounts of money or property on that basis. Instead of a class of permanent bosses and managers, self-management in which everyone voluntarily participated would become the norm. Each person regardless of his/her role would be accountable to the collective and would receive his or her fair share on the basis of what was needed. A fairer system in which you have a genuine say in what gets done, is likely to encourage people to participate but, just as now, there would be some tasks that are necessary but tedious or unpleasant. These jobs could be assigned on a rotational basis so that everyone has to do a little of it now and then, rather than particular people being stuck in a thankless position. In a sense a lot of things would go on as they always have, with workers doing tasks and projects, meeting deadlines, producing things and doing all the stuff they do now, but in a far healthier (in every sense) environment. To have a firm basis, this new economy would not survive if it consisted of isolated worksites. There would need to be some kind of co-ordinating mechanism so that each enterprise and community could work with the others to supply what each lacked. Workers could be periodically delegated to liaise with other organisations, communities and enterprises. These delegates would be there to carry out what is required by participating organisations and be accountable to them, rather than be there in his/her own right as sole owner of a company looking out for themselves or acting like a politician. Their positions or role as delegates would be temporary, just for the length of time required and they would have no authority to make vital decisions independently of those who put them in their roles. An anarchist society would certainly encounter challenges regarding resource distribution and scarcity. However, the level of technology available and its often mobile and decentralised nature (think of the internet for example) mean that it can potentially be harnessed to facilitate the trickier operations required on a larger or more geographically distant plane of organising. It is also likely that as the new economy develops it will spread in physical and conceptual directions that surpass ways that currently exist. This system would incorporate principles of equality of participation while remaining flexible to the needs of society, thus avoiding the worst aspects of both free market capitalism and top-heavy bureaucratic, state-driven approaches. Determining in advance the precise shape a future free society might take, is impossible. We can outline some of the main features of it, as above, but the exact circumstances that bring it about will colour it in certain ways. For example, if an anarchist society was established during a time of war or via revolution, it would have different pressures upon it than one that evolved peacefully over a long period. We are unlikely to have complete control over events and would have to be flexible around particular circumstances. It’s also important to enter into these efforts without an absolute guarantee of success. If the only way anything was achieved in life was a 100% money back guarantee, then nothing would ever get done. Let’s be clear, we aren’t claiming we can establish some kind of pie-in-the-sky ideal society with rivers of chocolate and fountains of lemonade (though if the oopah-loompahs occupied their factory that might happen). It is necessary to have some vision of what an ideal might look like though, in order to measure current conditions relative to it, at any point in time. Even the attainment of a number of our goals would still result in an amazing improvement in the quality of life for people. Given the small number of self-identifying anarchists in Aotearoa at the moment, our job here and now is to open up opportunities for our views to grow. We need to find varied ways of spreading our message. Some of these may be as simple as talking directly to neighbours, whanau, friends and colleagues during tea break, organising public meetings, putting on a play or using the internet. There may be organisations or campaign groups which currently exist in a form and with aims that are compatible with anarchist ideas. We can join these and hope to pursue worthwhile goals. In addition we sometimes have the resources and time to put ideas into practice via an assortment of projects we initiate ourselves. These may be intended to be temporary or long term and can involve all kinds of things from starting unions, cafes, newspapers/blogs, bands and performance groups, bike repair workshops, bookshops, information exchanges, community gardening and whatever else we can put together. We will have to do the best we can, no matter how minor, short lived or seemingly ineffectual that may be at times, while remembering that participation in something that is a living microcosm of what could exist on a wide scale, can be empowering. To sum up, as we see it, the choice comes down to accepting the status quo of the electoral circus, voting every few years for a party with a new leader or slightly new policy or stepping beyond this limited and limiting perspective and working towards something more and better. As the months leading up to this year’s election tick by and the media begin to hype this or that party, individual or policy, consider whether you want to stay in the game or start working towards the kind of ‘something more and better’ you deserve. ← The Fire Next Time?